Captain Rick: The Budget Act of 2013 kicks the ‘U.S. Debt Can’ down the road yet again. Passed by the U.S. House and expected to be passed by the U.S. Senate next week, I sense renewed concern for the fiscal demise of America. This act does not stop Americas insatiable thirst for debt spending. Debt will continue to rise at a reckless pace. 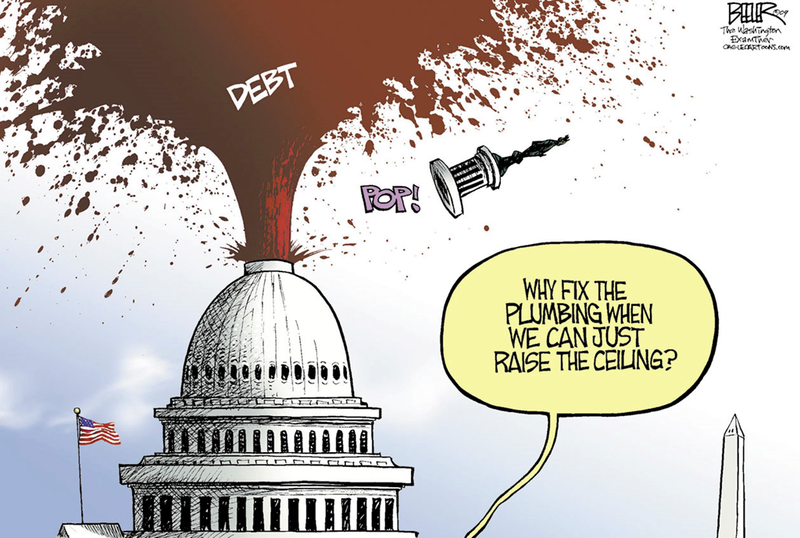 The U.S. debt ceiling will again be reached in February 2014. I would wager it will again be raised. I would also wager that America’s train will plunge over the real fiscal cliff in the coming years. At the bottom lies America as a third world nation. The frustration I feel is well summed up by Matt Salmon, my Arizona representative in the U.S. Congress. Matt is a person that uses intelligence and wisdom to speak and vote … a very rare find in Washington DC these days. “I applaud Chairman Ryan and our Republican Budget Conferees for working under difficult circumstances to negotiate a compromise with Senate Democrats, and I appreciate that this deal offers some positive items, such as helping to bring back regular order for the appropriations process, approving the Transboundary Hydrocarbon Agreement, restoring badly needed resources for our military, and making small changes to some mandatory spending programs. “However, for me and most of the constituents I have heard from in my district, this deal falls short of something I could support. “Unfortunately, this deal fails to even make modest reforms to our nearly bankrupted entitlement programs and it, once again, increases government spending in the short-term with only a promise to make spending cuts in the long-term. “If we are not willing to make tough choices now, then how can we expect future Congresses to stop kicking the can down the road? “This was a grand opportunity for our nation’s leaders to reform and preserve the fiscal longevity of our entitlement programs, and this deal does not rise to that challenge. “Furthermore, I have never believed that Congress should raise taxes or increase fees to justify more government spending. Sadly, this deal does exactly this by raising fees on air travelers. “As we move forward under these new spending caps, my hope is that Congress and President Obama will finally recognize that our fiscal problems are not solved by raising more revenue and increasing spending, but by cutting spending and addressing our biggest crisis – unsustainable entitlement spending. “We must make do with less government or our children and grandchildren will pay the heavy price as we continue to see a skyrocketing debt and runaway government spending. Rep. Matt Salmon (AZ-05) serves on the House Committee on Foreign Affairs as Chairman of the Subcommittee on the Western Hemisphere. He is also a member of the House Committee on Education and the Workforce. Follow him on Facebook and Twitter. Captain Rick: That “debt can” that President Obama kicked down the road on January 1 by signing of the American Taxpayer Relief Act of 2012, in an effort to avoid the Fiscal Cliff, revisits on March 27, 2013 when the federal government again faces a shutdown because it has again reached the debt ceiling, now set at $16.4 trillion. Funding for the U.S. government expires on March 27, 2013 unless Congress acts. If they fail, the federal government will shut down on March 28. All government operations would cease, except for essential services. Since lawmakers will not agree to a real budget by this date, they will have to agree on temporarily funding the government for a few weeks or a few months … again. The Republicans are presenting a plan on Thursday to extending funding to the end of the fiscal years which ends is September, but it includes a $7 billion restoration of defense funds in exchange for cuts elsewhere. A big question remains…will Democrats go along with this? It will all unfold in coming days. It is evident that the Republicans will allow no more tax increases…made very clear by House Speaker John A. Boehner (R-Ohio) who said on NBC’s “Meet the Press” that he discussed the need to avoid a shutdown with President Obama at a meeting Friday between the president and congressional leaders. Boehner said the House will vote this week to keep the federal government operating through September, when the fiscal year ends, and avoid a potentially politically damaging shutdown. The move would be the second time since the election that Boehner has avoided a fight, desired by some House conservatives, in order to keep the GOP from possible blame. He led House Republicans to raise the debt ceiling in January to fend off a repeat of the 2011 conflict that led to the sequester. Boehner said Republicans were done raising taxes after agreeing to the “fiscal cliff” deal in January that raised more than $600 billion in revenue. Any new revenue gained from closing tax loopholes, he said, should be put into lowering tax rates. Captain Rick’s closing thoughts … will Washington avert shutdown again”? I think most Americans are with me in expecting that Washington will pull off a circus act just prior to the closing curtain as it always manages to do. However, this showdown is not a done deal…especially concerning the defense appropriations. I think the Defense Department should endure the same cuts as as all others. I don’t think it needs special treatment. I believe many Americans believe the U.S. Defense Department could easily be cut without sacrificing America’s safety. I think many will agree that it is time for America to stop playing “Police of the World” …at American taxpayer expense. I welcome your comments, likes and shares!